Alphaline is an exclusive addition to our rich VEKA system offer with even better insulating parameters. It is the first mass-produced profile system featuring installation depth of 90 mm. Due to that, it enables the investors to meet the most vital demand, i.e. minimising the energy consumption of a building. 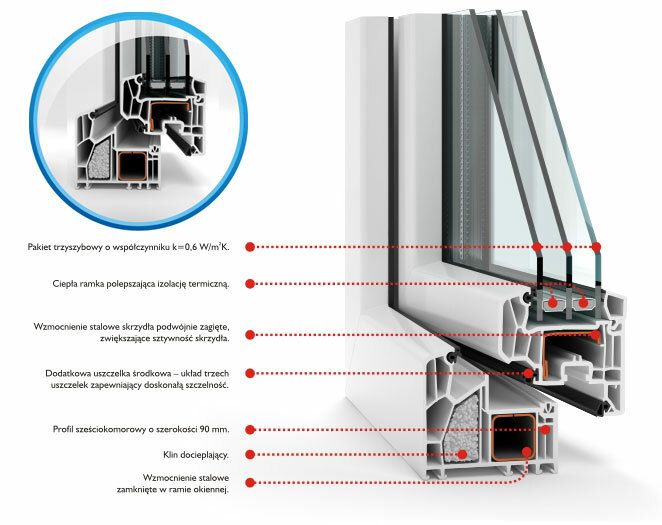 Compatibility of Alphaline with VEKA systems featuring build-in depth of 70 mm is another advantage. The combination of classical design and effective thermal insulation places this system miles ahead of the already available solutions. Technologically-perfect three seal system with a middle seal is an effective protection against cold, humidity and uncontrolled movement of air. Designed from scratch, 6-chamber geometry of Alphaline profiles has excellent insulating parameters, even in basic version. 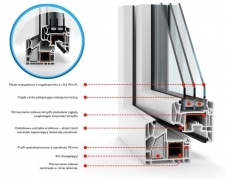 Extra wedge may be installed in a window frame profile for additional heat insulation. 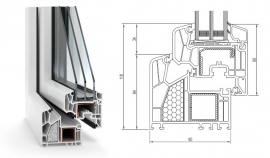 Alphaline is an exclusive addition to our broad VEKA system offer with even better insulating parameters. It is the first mass-produced profile system featuring installation depth of 90 mm. Due to that, it enables the investors to meet the most vital demand, i.e. minimising the energy consumption of a building. System for 90 mm installation depth and 6-chamber geometry. Pane thickness from 24 to 50 mm. Excellent heat insulating parameters even with 24 mm thick panes. Heat penetration factor Uw up to 0.9 W/m2K when using triple glazing and extra heat insulating wedge to fill chamber. Thickness of profile walls meets the highest requirements of RAL standards – "Class A" (PN-EN 12608). Triple seal system with a middle seal to ensure excellent tightness, acoustic and heat insulation. Factory-installed gray seals during an extruding process, may be joined together by heating. Steel reinforcement known from 70 mm profiles to ensure static stability and long-term use. Lean design with classical look and balanced proportions corresponding to Softline profiles. Low total side height of leaf and frame profiles at approx. 118 mm ensures larger glass pane area and great lighting parameters. Rigid installation of fittings in leaf and frame through several profile walls. Additional installation of load bearing elements of fittings in steel reinforcement possible. The same number of fittings as in 70 mm systems. 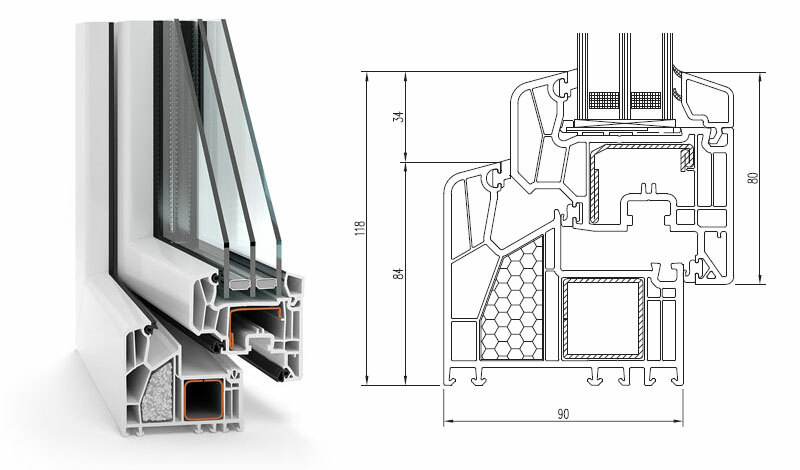 Broad range of compatible joining and accessory elements from 70 mm profile systems available.